Tips on choosing your sign from Hayne-West. Tips on choosing your sign. Our signs can be fixed to walls, fences, posts, doors, gates, trees, inserted into the ground and hung from brackets. They look great just about anywhere. We have provided the following tips below to help you choose a sign that will suit your purpose exactly and give satisfaction for many years to come. You may also find our frequently asked questions helpful. As well as considering the number of letters and size of emblem for your sign, it may be worthwhile considering the size of the sign itself on your house. A large sign on a small cottage, for example, could spoil the character of the cottage. Similarly, a small sign on a large mansion could look completely lost. Also, consider the distance your sign needs to be seen from. For example, if you intend to fix your sign to the wall of your house but you have a long driveway, will the lettering be large enough for the postman or visitors to read? Firstly, take a look at some samples in our gallery. The patterns are available in a number of different sizes, which are shown on our List. Once you have seen something you like, the next step is to browse through our emblems. You will see there are many to choose from. To make it easier to find them, we have listed them under categories. When choosing an emblem, consider the size of the sign pattern, the number of letters, and the word layout. For example, in the case of our Oxford Series (oval), a single word, or two short words, may be set out along the bottom or top curve only, in which case a slightly larger emblem can be accommodated than if the wording were set out both at the top and the bottom. In most cases we usually recommend using only one emblem. Two can be accommodated where space permits (usually on our larger signs) but the size of each emblem should be considered, for example, a pig may be the same size as a cow! The three examples to the right show the three styles of lettering available. Our experienced pattern maker will ensure the most suitable size of lettering is chosen for your sign so that your wording and emblem looks 'balanced' on it. Where space doesn't allow Times Roman lettering, we normally use the narrower Condensed Times lettering. Samples showing the different types of lettering can be seen in our gallery. Although black is by far the most popular choice you may wish to match your sign to, say, the colour of your door or your window frames, or perhaps to another sign. With a colour range which includes black, white, blue, green, red and brown, the most popular door colours, we can make it easy to do this. Special colour request are by quotation and we will require a RAL number. When considering the background colour please remember to take into account the colours of your chosen emblem. A black Aberdeen Angus Bull, for example, will be much more visible on a white background than it would be on a black one. The letter colour is also a matter of personal choice. Our standard letter colours are white or gold or, on a white background, black, but we can accommodate other requests at no extra charge if it is a colour we have in stock. Consider what would look good with your chosen emblem. For example, gold lettering echo the rich colours in an emblem of wheat or barley or an acorn with leaves painted in autumn colours, whereas white lettering can look particularly good with, say an emblem of a sheep or Fresian cow, or a house with white walls. You may wish to match the letter colour to an existing sign. Samples of letter colour used on customers' signs and post boxes can be seen in our gallery. Screws and coloured caps are supplied. However, as with any fixing, it is the responsibility of the installer to ensure they are suitable for the purpose. In the case of a hanging sign, lugs are cast onto the top of the sign. 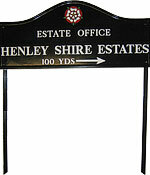 As a cost option brackets can be custom made to suit your sign, if required. (1) We can cast a single spike onto the bottom of the sign, or in the case of a longer sign, one either end. 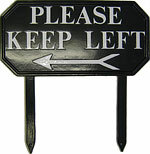 (2) We can supply two angled stakes, which can be bolted onto the back of the sign. What you choose will, to some extent, depend on the size of the sign. Spikes are normally more suitable for smaller signs and will allow the sign to sit nearer to the ground, whereas larger signs may need more support, and stakes may be the best option. Depending on how far you insert the stakes, the sign can stand much higher off the ground. In some instances, particularly in the case of large, heavy signs, it may be best to concrete the stakes into the ground. Spikes and stakes are available in different lengths (please refer to our List), and are powder-coated to match the sign. Please contact us for a quote. It is worthwhile taking time to clean your sign or post box now and again as the accumulation of dust, dirt and particles can make the surface look a little dull over time. We usually recommend using mild soapy water, taking care not to scratch the surface, and then gently drying with a soft cloth before spray polishing with a normal house-hold furniture polish. Regular treatment will help to keep your sign or post box looking good for many years to come. One of our customers, who brought a post box back after 20 years, for the letters and emblem to be re-painted, had been regularly using a brand of car polish. The condition of the powder-coating was still like new. Some old signs may need a 'face-lift' in time, and we can make them look new again by stripping them back to the bare metal, re-powder-coating them and re-painting the emblem and letters. There is even a chance to change the colours if you wish. However, we only carry out this procedure on our own signs, as not all cast metal signs will stand up to the oven treatment, as we found out when we agreed to refurbish a sign that wasn't 'one of ours'. Clearly the sign wasn't made from pure aluminium and it didn't take kindly to being put in the hot oven. Please Click here to see the catastrophic results.